Intensive farming involves various types of agriculture with higher levels of input and output per cubic unit of agricultural land area. It is characterized by a low fallow ratio, higher use of inputs such as capital and labour, and higher crop yields per cubic unit land area. This contrasts with traditional agriculture, in which the inputs per unit land are lower. The term "intensive" involves various meanings, some of which refer to organic farming methods (such as biointensive agriculture and French intensive gardening), and others that refer to nonorganic and industrial methods. Intensive animal farming involves either large numbers of animals raised on limited land, usually concentrated animal feeding operations (CAFOs), often referred to as factory farms, or managed intensive rotational grazing (MIRG), which has both organic and non-organic types. Both increase the yields of food and fiber per acre as compared to traditional animal husbandry. In CAFO, feed is brought to the seldom-moved animals, while in MIRG the animals are repeatedly moved to fresh forage. Most commercial agriculture is intensive in one or more ways. Forms that rely heavily on industrial methods are often called industrial agriculture, which is characterised by innovations designed to increase yield. Techniques include planting multiple crops per year, reducing the frequency of fallow years, and improving cultivars. It also involves increased use of fertilizers, plant growth regulators, and pesticides and mechanised agriculture, controlled by increased and more detailed analysis of growing conditions, including weather, soil, water, weeds, and pests. This system is supported by ongoing innovation in agricultural machinery and farming methods, genetic technology, techniques for achieving economies of scale, logistics, and data collection and analysis technology. Intensive farms are widespread in developed nations and increasingly prevalent worldwide. 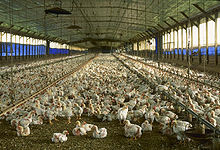 Most of the meat, dairy, eggs, fruits, and vegetables available in supermarkets are produced by such farms. Smaller intensive farms usually include higher inputs of labor and more often use sustainable intensive methods. The farming practices commonly found on such farms are referred to as appropriate technology. These farms are less widespread in both developed countries and worldwide, but are growing more rapidly. Most of the food available in specialty markets such as farmers markets is produced by these small holder farms. Agricultural development in Britain between the 16th century and the mid-19th century saw a massive increase in agricultural productivity and net output. This in turn supported unprecedented population growth, freeing up a significant percentage of the workforce, and thereby helped enable the Industrial Revolution. Historians cited enclosure, mechanization, four-field crop rotation, and selective breeding as the most important innovations. Industrial agriculture arose along with the Industrial Revolution. By the early 19th century, agricultural techniques, implements, seed stocks, and cultivars had so improved that yield per land unit was many times that seen in the Middle Ages. The industrialization phase involved a continuing process of mechanization. Horse-drawn machinery such as the McCormick reaper revolutionized harvesting, while inventions such as the cotton gin reduced the cost of processing. During this same period, farmers began to use steam-powered threshers and tractors, although they were expensive and dangerous. In 1892, the first gasoline-powered tractor was successfully developed, and in 1923, the International Harvester Farmall tractor became the first all-purpose tractor, marking an inflection point in the replacement of draft animals with machines. Mechanical harvesters (combines), planters, transplanters, and other equipment were then developed, further revolutionizing agriculture. These inventions increased yields and allowed individual farmers to manage increasingly large farms. The identification of nitrogen, phosphorus, and potassium (NPK) as critical factors in plant growth led to the manufacture of synthetic fertilizers, further increasing crop yields. In 1909, the Haber-Bosch method to synthesize ammonium nitrate was first demonstrated. NPK fertilizers stimulated the first concerns about industrial agriculture, due to concerns that they came with serious side effects such as soil compaction, soil erosion, and declines in overall soil fertility, along with health concerns about toxic chemicals entering the food supply. 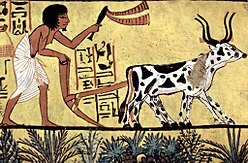 The identification of carbon as a critical factor in plant growth and soil health, particularly in the form of humus, led to so-called sustainable agriculture, as well as alternative forms of intensive agriculture that also surpassed traditional agriculture, without side effects or health issues. Farmers adopting this approach were initially referred to as humus farmers, later as organic farmers. The discovery of vitamins and their role in nutrition, in the first two decades of the 20th century, led to vitamin supplements, which in the 1920s allowed some livestock to be raised indoors, reducing their exposure to adverse natural elements. Chemicals developed for use in World War II gave rise to synthetic pesticides. Following World War II, synthetic fertilizer use increased rapidly, while sustainable intensive farming advanced much more slowly. Most of the resources in developed nations went to improving industrial intensive farming, and very little went to improving organic farming. 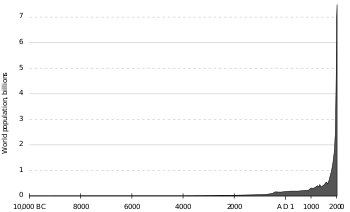 Thus, particularly in the developed nations, industrial intensive farming grew to become the dominant form of agriculture. The discovery of antibiotics and vaccines facilitated raising livestock in confined animal feeding operations by reducing diseases caused by crowding. Developments in logistics and refrigeration as well as processing technology made long-distance distribution feasible. Concerns over the sustainability of industrial agriculture, which has become associated with decreased soil quality, and over the environmental effects of fertilizers and pesticides, have not subsided. Alternatives such as integrated pest management (IPM) have had little impact because policies encourage the use of pesticides and IPM is knowledge-intensive. These concerns sustained the organic movement and caused a resurgence in sustainable intensive farming, as well as funding for the development of appropriate technology. Intensive livestock farming, also called "factory farming", is a term referring to the process of raising livestock in confinement at high stocking density. "Concentrated animal feeding operations" (CAFO), or "intensive livestock operations", can hold large numbers (some up to hundreds of thousands) of cows, hogs, turkeys, or chickens, often indoors. The essence of such farms is the concentration of livestock in a given space. The aim is to provide maximum output at the lowest possible cost and with the greatest level of food safety. The term is often used pejoratively. However, CAFOs have dramatically increased the production of food from animal husbandry worldwide, both in terms of total food produced and efficiency. Food and water is delivered to the animals, and therapeutic use of antimicrobial agents, vitamin supplements, and growth hormones are often employed. Growth hormones are not used on chickens nor on any animal in the European Union. Undesirable behaviors often related to the stress of confinement led to a search for docile breeds (e.g., with natural dominant behaviors bred out), physical restraints to stop interaction, such as individual cages for chickens, or physical modification such as the de-beaking of chickens to reduce the harm of fighting. The CAFO designation resulted from the 1972 U.S. Federal Clean Water Act, which was enacted to protect and restore lakes and rivers to a "fishable, swimmable" quality. The United States Environmental Protection Agency (EPA) identified certain animal feeding operations, along with many other types of industry, as "point source" groundwater polluters. These operations were subjected to regulation. In 17 states in the U.S., isolated cases of groundwater contamination were linked to CAFOs. For example, the ten million hogs in North Carolina generate 19 million tons of waste per year. The U.S. federal government acknowledges the waste disposal issue and requires that animal waste be stored in lagoons. These lagoons can be as large as 7.5 acres (30,000 m2). Lagoons not protected with an impermeable liner can leak into groundwater under some conditions, as can runoff from manure used as fertilizer. A lagoon that burst in 1995 released 25 million gallons of nitrous sludge in North Carolina's New River. The spill allegedly killed eight to ten million fish. The large concentration of animals, animal waste, and dead animals in a small space poses ethical issues to some consumers. Animal rights and animal welfare activists have charged that intensive animal rearing is cruel to animals. Other concerns include persistent noxious odor, the effects on human health, and the role of antibiotic use in the rise of resistant infectious bacteria. According to the U.S. Centers for Disease Control and Prevention (CDC), farms on which animals are intensively reared can cause adverse health reactions in farm workers. Workers may develop acute and/or chronic lung disease, musculoskeletal injuries, and may catch ( zoonotic) infections from the animals. Managed Intensive Rotational Grazing (MIRG), also known as cell grazing, mob grazing, and holistic management planned grazing, is a variety of foraging in which herds or flocks are regularly and systematically moved to fresh, rested grazing areas to maximize the quality and quantity of forage growth. MIRG can be used with cattle, sheep, goats, pigs, chickens, turkeys, ducks, and other animals. The herds graze one portion of pasture, or a paddock, while allowing the others to recover. Resting grazed lands allows the vegetation to renew energy reserves, rebuild shoot systems, and deepen root systems, resulting in long-term maximum biomass production. MIRG is especially effective because grazers thrive on the more tender younger plant stems. MIRG also leaves parasites behind to die off, minimizing or eliminating the need for de-wormers. Pasture systems alone can allow grazers to meet their energy requirements, and with the increased productivity of MIRG systems, the animals obtain the majority of their nutritional needs, in some cases all, without the supplemental feed sources that are required in continuous grazing systems. Pasture intensification is the improvement of pasture soils and grasses to increase the food production potential of livestock systems. It is commonly used to reverse pasture degradation, a process characterized by loss of forage and decreased animal carrying capacity which results from overgrazing, poor nutrient management, and lack of soil conservation. This degradation leads to poor pasture soils with decreased fertility and water availability and increased rates of erosion, compaction, and acidification. Degraded pastures have significantly lower productivity and higher carbon footprints compared to intensified pastures. Management practices which improve soil health and consequently grass productivity include irrigation, soil scarification, and the application of lime, fertilizers, and pesticides. Depending on the productivity goals of the target agricultural system, more involved restoration projects can be undertaken to replace invasive and under-productive grasses with grass species that are better suited to the soil and climate conditions of the region. These intensified grass systems allow higher stocking rates with faster animal weight gain and reduced time to slaughter, resulting in more productive, carbon-efficient livestock systems. Another technique to optimize yield while maintaining the carbon balance is the use of integrated crop-livestock (ICL) and crop-livestock-forestry (ICLF) systems, which combine several ecosystems into one optimized agricultural framework. These synergies between these systems provide benefits to pastures through optimal plant usage, improved feed and fattening rates, increased soil fertility and quality, intensified nutrient cycling, integrated pest control, and improved biodiversity. The introduction of certain legume crops to pastures increases carbon accumulation and nitrogen fixation in soils, while their digestibility helps animal fattening and reduces methane emissions from enteric fermentation. ICLF systems yield beef cattle productivity up to ten times that of degraded pastures, additional crop production from maize, sorghum, and soybean harvests, and greatly reduced greenhouse gas balances due to forest carbon sequestration. The Green Revolution transformed farming in many developing countries. It spread technologies that had already existed, but had not been widely used outside of industrialized nations. These technologies included "miracle seeds", pesticides, irrigation, and synthetic nitrogen fertilizer. With the availability of molecular genetics in Arabidopsis and rice the mutant genes responsible (reduced height (rht), gibberellin insensitive (gai1) and slender rice (slr1)) have been cloned and identified as cellular signalling components of gibberellic acid, a phytohormone involved in regulating stem growth via its effect on cell division. Photosynthetic investment in the stem is reduced dramatically as the shorter plants are inherently more mechanically stable. Nutrients become redirected to grain production, amplifying in particular the yield effect of chemical fertilizers. HYVs significantly outperform traditional varieties in the presence of adequate irrigation, pesticides, and fertilizers. In the absence of these inputs, traditional varieties may outperform HYVs. They were developed as F1 hybrids, meaning seeds need to be purchased every season to obtain maximum benefit, thus increasing costs. 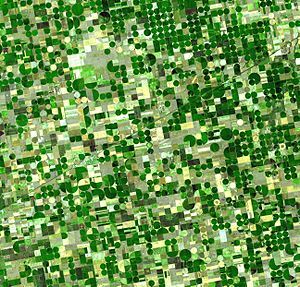 Satellite image of circular crop fields in Haskell County, Kansas, in late June 2001. Healthy, growing crops of corn and sorghum are green (sorghum may be slightly paler). Wheat is brilliant gold. Fields of brown have been recently harvested and plowed under or have lain in fallow for the year. Crop rotation or crop sequencing is the practice of growing a series of dissimilar types of crops in the same space in sequential seasons for benefits such as avoiding pathogen and pest buildup that occurs when one species is continuously cropped. Crop rotation also seeks to balance the nutrient demands of various crops to avoid soil nutrient depletion. A traditional component of crop rotation is the replenishment of nitrogen through the use of legumes and green manure in sequence with cereals and other crops. Crop rotation can also improve soil structure and fertility by alternating deep-rooted and shallow-rooted plants. A related technique is to plant multi-species cover crops between commercial crops. This combines the advantages of intensive farming with continuous cover and polyculture. 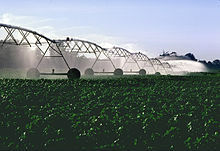 Crop irrigation accounts for 70% of the world's fresh water use. Flood irrigation, the oldest and most common type, is typically unevenly distributed, as parts of a field may receive excess water in order to deliver sufficient quantities to other parts. Overhead irrigation, using center-pivot or lateral-moving sprinklers, gives a much more equal and controlled distribution pattern. Drip irrigation is the most expensive and least-used type, but delivers water to plant roots with minimal losses. In agriculture, a terrace is a leveled section of a hilly cultivated area, designed as a method of soil conservation to slow or prevent the rapid surface runoff of irrigation water. Often such land is formed into multiple terraces, giving a stepped appearance. The human landscapes of rice cultivation in terraces that follow the natural contours of the escarpments, like contour ploughing, are a classic feature of the island of Bali and the Banaue Rice Terraces in Banaue, Ifugao, Philippines. In Peru, the Inca made use of otherwise unusable slopes by building drystone walls to create terraces. A paddy field is a flooded parcel of arable land used for growing rice and other semiaquatic crops. Paddy fields are a typical feature of rice-growing countries of east and southeast Asia, including Malaysia, China, Sri Lanka, Myanmar, Thailand, Korea, Japan, Vietnam, Taiwan, Indonesia, India, and the Philippines. They are also found in other rice-growing regions such as Piedmont (Italy), the Camargue (France), and the Artibonite Valley (Haiti). They can occur naturally along rivers or marshes, or can be constructed, even on hillsides. They require large water quantities for irrigation, much of it from flooding. It gives an environment favourable to the strain of rice being grown, and is hostile to many species of weeds. As the only draft animal species which is comfortable in wetlands, the water buffalo is in widespread use in Asian rice paddies. Paddy-based rice-farming has been practiced in Korea since ancient times. A pit-house at the Daecheon-ni archaeological site yielded carbonized rice grains and radiocarbon dates indicating that rice cultivation may have begun as early as the Middle Jeulmun Pottery Period (c. 3500–2000 BC) in the Korean Peninsula. The earliest rice cultivation there may have used dry-fields instead of paddies. The earliest Mumun features were usually in naturally swampy, low-lying narrow gulleys and fed by local streams. Some Mumun paddies in flat areas were made of a series of squares and rectangles separated by bunds approximately 10 cm in height, while terraced paddies were long and irregular in shape, following the natural contours of the land at various levels. Like today, Mumun period rice farmers used terracing, bunds, canals, and small reservoirs. Some paddy-farming techniques of the Middle Mumun period (c. 850–550 BC) can be interpreted from the well-preserved wooden tools excavated from archaeological rice paddies at the Majeon-ni site. Iron tools for paddy-farming were not introduced until sometime after 200 BC. The spatial scale of individual paddies, and thus entire paddy-fields, increased with the regular use of iron tools in the Three Kingdoms of Korea Period (c. AD 300/400–668). A recent development in the intensive production of rice is System of Rice Intensification (SRI). Developed in 1983 by the French Jesuit Father Henri de Laulanié in Madagascar, by 2013 the number of smallholder farmers using SRI had grown to between 4 and 5 million. Aquaculture is the cultivation of the natural products of water (fish, shellfish, algae, seaweed, and other aquatic organisms). Intensive aquaculture takes place on land using tanks, ponds, or other controlled systems, or in the ocean, using cages. Sustainable intensive farming practices have been developed to slow the deterioration of agricultural land and even regenerate soil health and ecosystem services, while still offering high yields. Most of these developments fall in the category of organic farming, or the integration of organic and conventional agriculture. The System of Crop Intensification (SCI) was born out of research primarily at Cornell University and smallholder farms in India on SRI. It uses the SRI concepts and methods for rice and applies them to crops like wheat, sugarcane, finger millet, and others. It can be 100% organic, or integrated with reduced conventional inputs. Holistic management is a systems thinking approach that was originally developed for reversing desertification. Holistic planned grazing is similar to rotational grazing but differs in that it more explicitly provides a framework for adapting to four basic ecosystem processes: the water cycle, the mineral cycle (including the carbon cycle), energy flow, and community dynamics (the relationship between organisms in an ecosystem) as equal in importance to livestock production and social welfare. By intensively managing the behavior and movement of livestock, holistic planned grazing simultaneously increases stocking rates and restores grazing land. Pasture cropping involves planting grain crops directly into grassland without first applying herbicides. The perennial grasses form a living mulch understory to the grain crop, eliminating the need to plant cover crops after harvest. The pasture is intensively grazed both before and after grain production using holistic planned grazing. This intensive system yields equivalent farmer profits (partly from increased livestock forage) while building new topsoil and sequestering up to 33 tons of CO2/ha/year. The Twelve Aprils grazing program for dairy production, developed in partnership with the USDA-SARE, is similar to pasture cropping, but the crops planted into the perennial pasture are forage crops for dairy herds. This system improves milk production and is more sustainable than confinement dairy production. Integrated multi-trophic aquaculture (IMTA) is an example of a holistic approach. IMTA is a practice in which the by-products (wastes) from one species are recycled to become inputs (fertilizers, food) for another. Fed aquaculture (e.g. fish, shrimp) is combined with inorganic extractive (e.g. seaweed) and organic extractive aquaculture (e.g. shellfish) to create balanced systems for environmental sustainability (biomitigation), economic stability (product diversification and risk reduction), and social acceptability (better management practices). Biointensive agriculture focuses on maximizing efficiency such as per unit area, energy input, and water input. Agroforestry combines agriculture and orchard/forestry technologies to create more integrated, diverse, productive, profitable, healthy, and sustainable land-use systems. Intercropping can increase yields or reduce inputs and thus represents (potentially sustainable) agricultural intensification. However, while total yield per acre is often increased dramatically, yields of any single crop often diminish. There are also challenges to farmers relying on farming equipment optimized for monoculture, often resulting in increased labor inputs. Vertical farming is intensive crop production on a large scale in urban centers, in multi-story, artificially-lit structures, using far less inputs and producing fewer environmental impacts. The challenges and issues of industrial agriculture for society, for the industrial agriculture sector, for the individual farm, and for animal rights include the costs and benefits of both current practices and proposed changes to those practices. This is a continuation of thousands of years of invention in feeding ever-growing populations. [W]hen hunter-gatherers with growing populations depleted the stocks of game and wild foods across the Near East, they were forced to introduce agriculture. But agriculture brought much longer hours of work and a less rich diet than hunter-gatherers enjoyed. Further population growth among shifting slash-and-burn farmers led to shorter fallow periods, falling yields and soil erosion. Plowing and fertilizers were introduced to deal with these problems - but once again involved longer hours of work and degradation of soil resources (Boserup, The Conditions of Agricultural Growth, Allen and Unwin, 1965, expanded and updated in Population and Technology, Blackwell, 1980.). While the point of industrial agriculture is to profitably supply the world at the lowest cost, industrial methods have significant side effects. Further, industrial agriculture is not an indivisible whole, but instead is composed of multiple elements, each of which can be modified in response to market conditions, government regulation, and further innovation, and has its own side-effects. Various interest groups reach different conclusions on the subject. Between 1930 and 2000, U.S. agricultural productivity (output divided by all inputs) rose by an average of about 2 percent annually, causing food prices to decrease. "The percentage of U.S. disposable income spent on food prepared at home decreased, from 22 percent as late as 1950 to 7 percent by the end of the century." Industrial agriculture uses huge amounts of water, energy, and industrial chemicals, increasing pollution in the arable land, usable water, and atmosphere. Herbicides, insecticides, and fertilizers are accumulating in ground and surface waters. "Many of the negative effects of industrial agriculture are remote from fields and farms. Nitrogen compounds from the Midwest, for example, travel down the Mississippi to degrade coastal fisheries in the Gulf of Mexico. But other adverse effects are showing up within agricultural production systems—for example, the rapidly developing resistance among pests is rendering our arsenal of herbicides and insecticides increasingly ineffective." Agrochemicals and monoculture have been implicated in Colony Collapse Disorder, in which the individual members of bee colonies disappear. Agricultural production is highly dependent on bees to pollinate many varieties of fruits and vegetables. A study done for the U.S. Office of Technology Assessment conducted by the UC Davis Macrosocial Accounting Project concluded that industrial agriculture is associated with substantial deterioration of human living conditions in nearby rural communities. ^ a b "Encyclopædia Britannica's definition of Intensive Agriculture". britannica.com. ^ "BBC - Error 404 : Not Found". bbc.co.uk. ^ "- Define at Dictionary.com". www.dictionary.com. ^ "Encyclopædia Britannica's definition of Factory farm". britannica.com. ^ * Overton, Mark. Agricultural Revolution in England 1500 - 1850 (September 19, 2002), BBC. Valenze, Deborah. The First Industrial Woman (New York: Oxford University Press, 1995), p. 183. Kagan, Donald. The Western Heritage (London: Prentice Hall, 2004), p. 535-9. ^ Noel Kingsbury (2009). Hybrid: The History and Science of Plant Breeding. Chicago: University of Chicago Press. ^ Janick, Jules. "Agricultural Scientific Revolution: Mechanical" (PDF). Purdue University. Retrieved 2013-05-24. ^ Reid, John F. (Fall 2011). "The Impact of Mechanization on Agriculture". The Bridge on Agriculture and Information Technology. 41 (3). ^ "A Historical Perspective". International Fertilizer Industry Association. Archived from the original on 2012-03-09. Retrieved 2013-05-07. ^ a b Matson; Parton, WJ; Power, AG; Swift, MJ; et al. (1997). "Agricultural Intensification and Ecosystem Properties". Science. 277 (5325): 504–9. CiteSeerX 10.1.1.484.4218. doi:10.1126/science.277.5325.504. PMID 20662149. ^ Testimony by Leland Swenson, president of the U.S. National Farmers' Union, before the House Judiciary Committee, September 12, 2000. ^ Philpott, Tom (19 April 2013). "A Brief History of Our Deadly Addiction to Nitrogen Fertilizer". Mother Jones. Retrieved 2013-05-07. Turner, Jacky. "History of factory farming" Archived 2013-11-16 at the Wayback Machine, United Nations: "Fifty years ago in Europe, intensification of animal production was seen as the road to national food security and a better diet ... The intensive systems – called 'factory farms' – were characterised by confinement of the animals at high stocking density, often in barren and unnatural conditions." "Head to head: Intensive farming", BBC News, March 6, 2001: "Here, Green MEP Caroline Lucas takes issue with the intensive farming methods of recent decades ... In the wake of the spread of BSE from the UK to the continent of Europe, the German Government has appointed an Agriculture Minister from the Green Party. She intends to end factory farming in her country. This must be the way forward and we should end industrial agriculture in this country as well." ^ Kaufmann, Mark. "Largest Pork Processor to Phase Out Crates", The Washington Post, January 26, 2007. ^ "EU tackles BSE crisis", BBC News, November 29, 2000. ^ Duram, Leslie A. (2010). Encyclopedia of Organic, Sustainable, and Local Food. ABC-CLIO. p. 139. ISBN 978-0-313-35963-7. ^ Sweeten, John et al. "Fact Sheet #1: A Brief History and Background of the EPA CAFO Rule". MidWest Plan Service, Iowa State University, July 2003. ^ "North Carolina's Hog Waste Lagoons: A Public Health Time Bomb". edf.org. ^ Orlando, Laura. McFarms Go Wild, Dollars and Sense, July/August 1998, cited in Scully, Matthew. Dominion, St. Martin's Griffin, p. 257. ^ Beetz, A.E. 2004. Rotational grazing: Livestock systems guide. National Sustainable Agriculture Information Service (ATTRA). ^ Undersander, Dan; et al. "Pastures for profit: A guide to rotational grazing" (PDF). University of Wisconsin Extension. Retrieved 5 April 2013. ^ Undersander, D., Albert, B., Cosgrove, D., Johnson, D., Peterson, P. 2002. Pastures for profit: A guide to rotational grazing. UW-Extension. ^ a b c d Zimmer, Ademir; Macedo, Manuel; Neivo Kichel, Armindo; Almeida, Roberto (2012-11-01). Degradação, recuperação e renovação de pastagens. ^ a b de Figueiredo, Eduardo Barretto; Jayasundara, Susantha; Bordonal, Ricardo de Oliveira; Berchielli, Telma Teresinha; Reis, Ricardo Andrade; Wagner-Riddle, Claudia; Jr., Newton La Scala (2017). "Greenhouse gas balance and carbon footprint of beef cattle in three contrasting pasture-management systems in Brazil". Journal of Cleaner Production. 142: 420–431. doi:10.1016/j.jclepro.2016.03.132. ^ "Indicativo de pastagens plantadas em processo de degradação no bioma Cerrado. - Portal Embrapa". www.embrapa.br (in Portuguese). Retrieved 2018-03-28. ^ Bogaerts, Meghan; Cirhigiri, Lora; Robinson, Ian; Rodkin, Mikaela; Hajjar, Reem; Junior, Ciniro Costa; Newton, Peter (2017). "Climate change mitigation through intensified pasture management: Estimating greenhouse gas emissions on cattle farms in the Brazilian Amazon". Journal of Cleaner Production. 162: 1539–1550. doi:10.1016/j.jclepro.2017.06.130. ^ a b c Cardoso, Abmael S.; Berndt, Alexandre; Leytem, April; Alves, Bruno J.R.; Carvalho, Isabel das N.O. de; Soares, Luis Henrique de Barros; Urquiaga, Segundo; Boddey, Robert M. (2016). "Impact of the intensification of beef production in Brazil on greenhouse gas emissions and land use" (PDF). Agricultural Systems. 143: 86–96. doi:10.1016/j.agsy.2015.12.007. ^ a b Talamini, Edson; Ruviaro, Clandio Favarini; Florindo, Thiago José; Florindo, Giovanna Isabelle Bom De Medeiros (2017). "Improving feed efficiency as a strategy to reduce beef carbon footprint in the Brazilian Midwest region". International Journal of Environment and Sustainable Development. 16 (4): 379. doi:10.1504/ijesd.2017.10007706. ^ a b Ruviaro, Clandio F.; Léis, Cristiane Maria de; Lampert, Vinícius do N.; Barcellos, Júlio Otávio Jardim; Dewes, Homero (2015). "Carbon footprint in different beef production systems on a southern Brazilian farm: a case study". Journal of Cleaner Production. 96: 435–443. doi:10.1016/j.jclepro.2014.01.037. hdl:10183/122628. ^ a b Balbino, Luiz; Neivo Kichel, Armindo; Bungenstab, Davi; Almeida, Roberto (2014-03-01). Integrated systems: what they are, their advantages and limitations. pp. 11–18. ISBN 9788570352972. ^ "Methane - Rice". www.ghgonline.org. ^ Crawford, Gary W.; Lee, Gyoung-Ah (2003). "Agricultural origins in the Korean Peninsula". Antiquity. 77 (295): 87–95. ^ Vidal, John (16 February 2013). "India's rice revolution". The Observer. London: The Guardian. Retrieved 21 May 2013. ^ "SRI CONCEPTS AND METHODS APPLIED TO OTHER CROPS". Cornell University. Retrieved 1 October 2014. ^ "The System of Crop Intensification Agroecological Innovations for Improving Agricultural Production, Food Security, and Resilience to Climate Change" (PDF). SRI International Network and Resources Center. Cornell University. Retrieved 1 October 2014. ^ a b Teague, W R; S. L. Dowhowera; S.A. Bakera; N. Haileb; P.B. DeLaunea; D.M. Conovera (2011). "Grazing management impacts on vegetation, soil biota and soil chemical, physical and hydrological properties in tall grass prairie". Agriculture, Ecosystems & Environment. 141, Issues 3–4, May 2011, Pages 310–322 (3–4): 310. doi:10.1016/j.agee.2011.03.009. ^ Schwartz, Judith D. "Soil as Carbon Storehouse: New Weapon in Climate Fight?". Yale Environment 360. Yale School of Forestry & Environmental Studies. Retrieved 25 June 2014. ^ Fairlie, Simon. "Maximizing Soil Carbon Sequestration: Carbon Farming and Rotational Grazing". Mother Earth News August 21, 2012. Retrieved 7 April 2013. ^ "FIRST MILLIMETER: HEALING THE EARTH PREVIOUS BROADCASTS". KQED PUBLIC MEDIA FOR NORTHERN CALIFORNIA. Retrieved 20 April 2013. ^ "The First Millimeter: Healing the Earth". Santa Fe Productions. Retrieved 20 April 2013. ^ Archer, Steve, Fred E. Smeins. Grazing Management an ecological perspective edited by Rodney K Heitschmidt and Jerry W Stuth. p. Chapter 5. ^ Leu, Andre. "Mitigating Climate Change With Soil Organic Matter in Organic Production Systems" (PDF). Trade and environment review 2013, Commentary V pp.22-32. UNCTAD. Retrieved 28 September 2014. ^ "12 Aprils Dairy Grazing Manual". USDA-SARE. Retrieved 1 October 2014. ^ Chopin T, Buschmann AH, Halling C, Troell M, Kautsky N, Neori A, Kraemer GP, Zertuche-Gonzalez JA, Yarish C and Neefus C. 2001. Integrating seaweeds into marine aquaculture systems: a key toward sustainability. Journal of Phycology 37: 975-986. ^ "Moseley, W.G. 2011. "Make farming energy efficient." Atlanta Journal-Constitution. June 3. pg. 15A". ajc.com. ^ "What is a dead zone?". NOAA. Retrieved 18 April 2015. ^ Loarie, Greg (2014-05-02). "THE CASE OF THE VANISHING BEES". EarthJustice. Retrieved 18 April 2015. Juri Nascimbene, Lorenzo Marini, and Maurizio G. Paoletti. Environmental Management; May2012, Vol. 49 Issue 5, p1054-1060, 7p. This page was last edited on 5 March 2019, at 16:03 (UTC).